If you would like to purchase more than one CD at a time, please send an email request to sonny@sonnyrose.com. Please include the number of CDs you wish to purchase along with your shipping address. 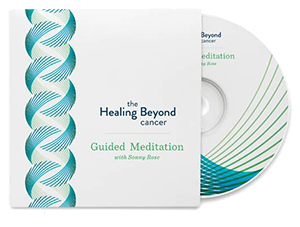 The Healing Beyond Cancer Guided Meditations are designed to enhance a deeper intuitive connection resulting in a state of peace and empowerment. A cancer diagnosis often evokes states of stress, fear, depression, numbness or hopelessness. This leads to a stressful impact on the immune system. Studies have proven that meditation, not only produces states of relaxation, but also creates massive changes in brain structure. Changing the brain, changes our overall feeling of well-being and quality of life. This 63 minute CD contains 6 different guided meditations. 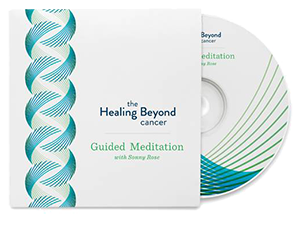 The Healing Beyond Cancer Guided Meditations promote a balance of mind, body and spirit. Ambient music is an added element lending richness and texture to the vocal guided meditations. The late David Maxwell plays gongs, bells, and shakers, reawakening us into awareness. Mac Ritchey plays the electric oud and zyra with acute sensitivity and intuition, allowing for spaciousness of silence between the notes. The soulful sound of flute and shakuhachi, played by Geni Skendo, holds the energy of intention and grace, inviting us into a deep state of consciousness. I love your voice quality, your imagery and the incredible music you have gathered together..I listened to all of the meditations in sequence. By the last two I was out in delta waves and came back into the room with surprise, profoundly rested. Your clients will feel cradled in love and expanded to the ends of the universe. What a GIFT you have created, Sonny!!!! Thank you —more than I can say—for sharing. Sonny Rose has created a series of masterful healing journeys, with sounds of bells flutes and other exquisite music that evoke the sacred landscapes in which she is leading you. Her voice soothes, empowers and guides you to your own inner wisdom and new images of health.